Discussion in 'Black Hat SEO' started by nonai, Aug 21, 2014. I dont want to give them my real debit card because they might empty my account. what is everyone using to fund sape? what is the cheapest way to get a debit card where you can put a limited amount? They won't empty your account. they might empty my account. Can't do that in Russia, or they'd be Putin them in jail. Green dot money packs use to be great until they changed their policies and stopped all international payments (people were abusing them to import drugs). But I know for a fact there is another service similar to money dot. Most services charge like $5 / month but it's well worth it imo. I've been a victim of identify theft before and ever since then I try to use prepaids for all international CC payments. Just search online and I'm sure you can find some. Don't be Russian to conclusions now there tony_d. 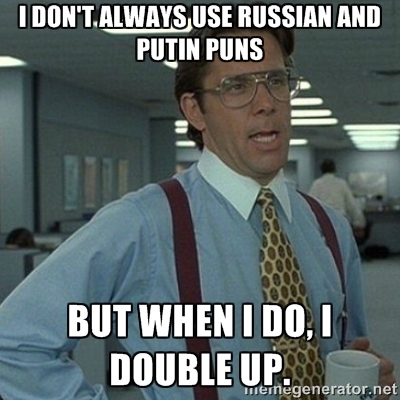 Yeah if we could go ahead and stop hijacking this thread with memes and Russian puns. That'd be grreat. bartosimpsonio! You are racist! You are trying to say that whole Russian nation do CC frauds? I would like the mods to take action against this guy. Dont think debit card will work, go for credit card. Your money will remain intact so go ahead and use your debit card. SAPE uses a reputable payment processor called PayOnline.ru and uses a secure certificate, so there's no chance for fraud. You can use VCC card to fund Sape campaigns. Example, Entropay. I don't think he said or implied that Russians are fraudsters. Bad pun? Yes, but racism? Hell no.